The following information is provided: cold fluid—air; hot fluid—air, Tc,i , Th,i , Tc,o, pc,i , ph,i, ˙ mc, ˙ mh, .pc, .ph; heat exchanger flow arrangement type—single-pass, crossflow unmixed-unmixed flow arrangement. The principal dimensions of the core must be determined: (1) fluid flow lengths (core dimensions) in directions of hot and cold fluid flows and (2) the dimension of the stack of alternate layers of flow passages in the direction orthogonal to crossflow planes. Determination of the core dimensions assumes an a priori decision regarding selection of heat-transfer surface types on both sides of a heat exchanger. This selection is, as a rule, within the realm of an engineer’s decisions for any sizing problem; thus, it is not necessarily given in the problem formulation. In the present calculation, a decision regarding the surface selection will be made at a point when geometric and heattransfer and/or hydraulic characteristics of the core need to be assessed for the first calculation iteration. That decision may always be modified and calculation repeated. The types of heat-transfer surfaces will be selected, and data involving geometric, heat-transfer, and hydraulic properties will be obtained from a database given in Kays and London (1998). The assumptions on which the calculation procedure is based are listed and discussed in detail in Shah and Sekulic (2003, chap. 3, p. 100) and will not be repeated here (standard assumptions for designing a compact heat exchanger). Design procedure for a sizing problem features two distinct segments of calculation. The first one delivers the magnitude of the thermal size of the core, expressed as an overall heat-transfer area A, and/or formulated as a product of the overall heat-transfer coefficient and the heat-transfer area UA. Determination of this quantity should be based on an application of thermal energy balance [i.e., the heat-transfer rate delivered by one fluid is received by the other; no losses (gains) to (from) the surroundings are present]. Formulation of this balance involves a fundamental analysis of heat-transfer phenomena within the heat exchanger core, which can be summarized through a concept of heat exchanger effectiveness, Shah and Sekulic (2003). 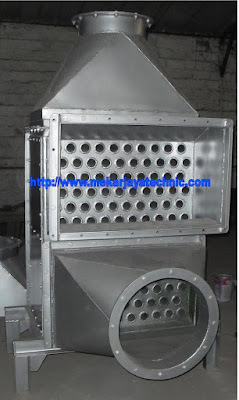 The resulting design procedure is the “effectiveness number of heat-transfer units” method. The effectiveness is expressed in terms of known (or to bedetermined) inlet/outlet temperatures, and mass flow rates (for known fluids). The unknown temperatures (for some problem formulations) must be determined (i.e., they may not be known a priori—such as theoutlet temperature of the hot fluid in this problem), and any assumed thermo-physical properties should be re-calculated multiple times (i.e.,an iterative procedure is inherent). This feature of the calculation is only one aspect of the design methodology that ultimately leads to an iterative calculation sequence. The second reason for an iterative nature of this procedure is, as a rule, inherently transcendent structure of the effectiveness-number-of-heat-transfer correlation (for the crossflow unmixed-unmixed arrangement, as in the case that will be revealed in step TDG-8 in the tabular list below). Finally, the third and main reason for an iterative procedure is a constraint imposed on pressure drops. The magnitudes of pressure drops must be obtained from the hydraulic part of the design procedure. The hydraulic design part of the procedure cannot be decoupled from the thermal part, which leads to the calculation of pressure drops after thermal calculations are completed, and hence is followed by a comparison of calculated pressure drops with the imposed limits. As a rule, these limits are not necessarily satisfied after the first iteration, and subsequent iterations are needed. In this routine calculation presentation, determination of the thermal size of the heat exchanger will be termed the “targeting the design goal” (TDG) procedure. Each step will be separately marked for the purpose of cross-referencing. The second segment of the calculation is devoted to the determination of actual overall dimensions of the core, in a manner to satisfy the required overall heat-transfer area and to achieve the overall heat-transfer coefficient, that is, to satisfy the required thermal size. This segment is inherently iterative because it requires a satisfaction of pressure drop constraints as emphasized above. This segment of calculation will be termed “matching (the design goal and) geometric characteristics” (MGC) procedure. Both procedures will be organized as a continuous sequence of calculations and presented in a tabular format for the sake of compactness and easy access to various steps. The most important comments will be given as the notes to the respective calculation steps immediately after the equation(s) defining the step. A detailed discussion of numerous aspects of these calculations, and the issues involving relaxation of the assumptions, are provided in Shah and Sekulic (2003). The reader is advised to consult that source while following the stepby- step calculation procedure presented here. Some numerical values of the derivative variables presentedmay differ from the calculated values because of rounding for use elsewhere within the routinely determined data.